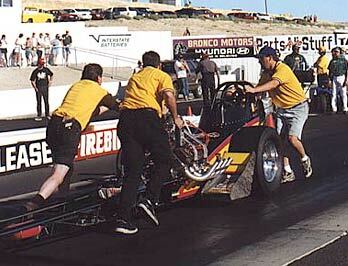 Since Boise wasn't a points race, Team WW2 had a lot less pressure to perform going in. 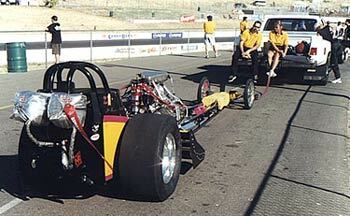 Nonetheless, they didn't let their guard down and qualified in the #2 slot and set top speed of the meet at 222. Here's a sequence of shots by Jim Sorenson documenting an afternoon session. 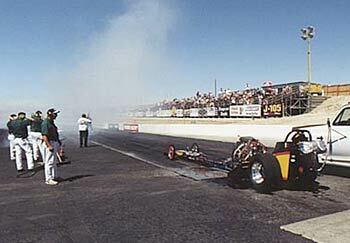 Since they don't run a reverser, Jim usually waits until the other car makes their burn-out before starting his. 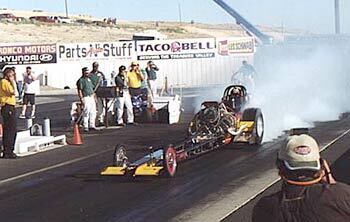 With his opponent backing up to the line, Murphy heats up his tires in a relatively short burn-out. This would be the WW2 "reverser". Not the teams favorite thing on a 100+ degree day in Idaho (or anywhere else). 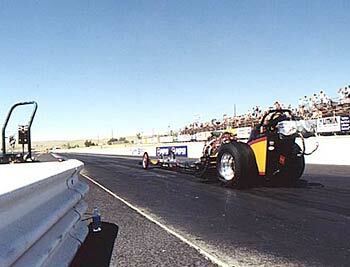 Jim Murphy launches the WW2 Top Fuel Dragster on another pass down the Boise quarter mile. Casual dress was the word of the day... especially when maintenance to the car was necessary. This is done after every run the car makes. 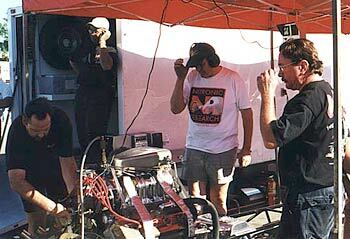 Prior to actually making a run with the car the engine is warmed up and checked in the pits. Besides building heat, it often reveals potential problems that can be fixed prior to the run. And -- the fans love it! 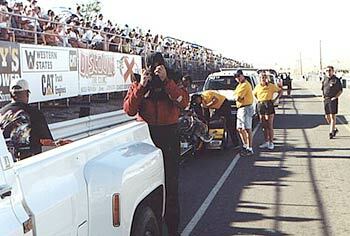 There's always a calm before the storm -- this calm is called waiting in the staging lanes. 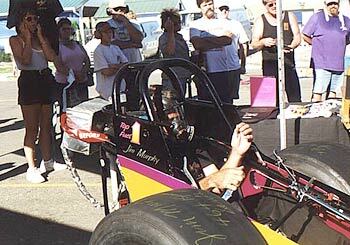 At the last minute (especially on a hot day) Murphy dons his multi-layer Simpson fire suit and mask. Drivers safety equipment has made quantum leaps over the years and this has resulted in fewer and less severer burns from engine explosions and crashes.